Nothing like staying up until two in the a.m. blogging about my most recent adventure into Korean cinema. And yes, it is another return to Song Kang-ho's formidable back catalog. I guess I am on a bit of a Kang-ho kick right now. I get that way sometimes. I have a couple of other Korean films to get to (as well as a Korean drama called Secret Garden), but Secret Reunion has been on my list for long enough that I felt its time was finally due. I was hoping this movie would alleviate my mental discombobulation somewhat. And it did. So it certainly served its purpose. It was entertaining and definitely fun. But I suppose just saying that would make for a pointless blog post. I could have said that in a tweet. So let's do some real digging into this movie and see what makes it tick. At the start of this film it seems like it is going to be another barn-burner. Lee Han-gyu (Song Kang-ho) is a South Korean NIS agent chasing after a spy from North Korea named Song Ji-won (Kang Dong-won) and some old assassin guy known only as Shadow (Jun Gook-hwan). Been there before, right? However, the movie makes things neat by making it feel like we are at the end of a movie when we are actually at the beginning. In fact, I was wondering if I was watching a sequel of some sort for the first ten minutes or so. The chase ends with the Shadow missing, Song Ji-won abandoned by his country and left to go on the run, and Lee Han-gyu disgraced and jobless. 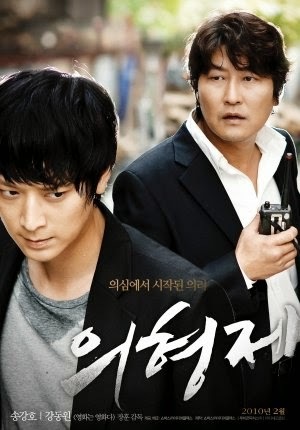 Six years later Lee Han-gyu is working for a company that tracks down runaway wives and one day he comes across his former quarry Song Ji-won. Rather than just turn him in and have glory stolen from him, Lee Han-gyu decides to try a different tactic. He wants to keep an eye on his movements and bring down an entire spy ring himself. So Han-gyu offers him a job and the two move in together. Song Ji-won is not an idiot, though. He knows very well who his boss/roommate is. He accepts the job and room in order to keep tabs on his new boss. This is where the movie begins. The two of them claim to not really know the other one and quickly change what they are doing each time the other shows up. They follow each other and spy on each other... and then go home for dinner and hang out. It's actually a bit... funny. Can you say " situational comedy" anyone? Of course, this movie has suspense and some brutal violence, but the real meat of the story is how the two characters bond without really meaning to bond. The action slows down in the middle, but the chemistry between the two actors is really good and their friendship seems real and that pushes things forward. The consequences of their treasonous friendship seem very real, too. The ending was satisfying... if not a bit too crowd-pleasing. While certainly not as good as JSA (which covered a similar topic), Secret Reunion is certainly a worthy outing for Song Kang-ho.